We visited Lessness Heath Primary School to congratulate them on their wellbeing provision and present them with the Wellbeing Award for Schools. Sunshine and blue skies set the scene for a day of celebration at Lessness Heath Primary School. The school is the first to achieve the Wellbeing Award for Schools (WAS), a whole-school award focusing on ensuring effective practice and provision is in place that promotes the positive mental health and wellbeing of staff and pupils. The award was created by Optimus Education in partnership with The National Children’s Bureau (NCB). A guest list including YoungMinds, The Primary First Trust, local MPs, the Mayor and Mayoress of Bexley, Mind in Bexley, HeadStart Kent, Optimus, NCB and more were welcomed onto the school field by staff, including wellbeing leader Kelly Hannaghan, and some of the 600 excited pupils. It was fitting then, that next up was some of the pupils to bravely stand in front of the audience and explain what wellbeing means to them. Introduced by Kelly, who was bought into the school to improve wellbeing provision, the children took it in turns to offer ways they look after themselves, including yoga, breathing exercises and taking time out when things become too much. They talked about the chill out club at the school, where ‘we can go and just be ourselves’ – a place that every single one of us can do with having. They had some advice for the audience too: ‘Look after yourself and each other!’ Wise words from young voices. 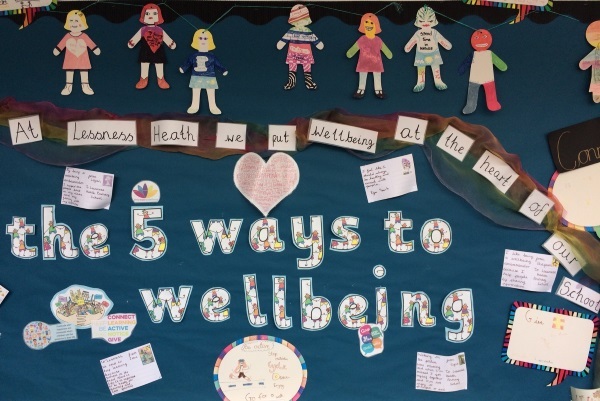 The pupils offered these five ways to wellbeing for everyone, no matter your age. Connect: meet up with friends, spend time with family and loved ones. Be active: whether you go on a long walk or climb a tree, get regular exercise you enjoy. Take notice: of your surroundings, your friends and your teachers! Keep learning: listen, pay attention and you really can learn something new every day. Give: be it a smile, a helping hand or a thank you, sometimes the smallest things are the most appreciated. 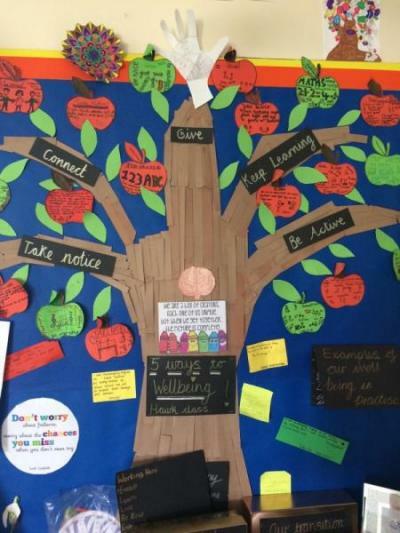 ‘Wellbeing at the heart of our school’ is the mantra at Lessness Heath and it’s clearly embedded throughout the school. From pupil therapeutic play and draw and talk sessions, to the parent Family Matters programme (which concentrates on positive parental health and wellbeing to enhance family life), the bright and welcoming staff room and staff social activities such as cinema club, the whole-school emphasis on positive mental health and wellbeing is evident. There are tangible results too, with the number of staff absences decreasing. The pupils are rightly proud of the work they and the school have been doing to create this whole-school approach. ‘Mental health is just as important as physical health,’ said one of the pupils, ‘Sometimes your brain can get sick and needs looking after,’ – and sometimes it takes a simple explanation to describe how important something is. Tissues were passed round and there wasn’t a dry eye in the house as all 600 pupils and staff members performed the song ‘This is me’ from The Greatest Showman film, receiving huge applause as pupils released balloons into the clear blue sky. A hard act to follow, up next were Mayor and Mayoress of Bexley. The Mayor, left speechless by the performance was quick to encourage another round of applause to give him time to gather his words! With over 500 schools currently taking the WAS, the excitement was clear to see as the time came for Lessness Heath to be presented with the award. Staff were joined on stage by Lola, the school’s wellbeing puppy. Just 13 weeks old, Lola is currently undertaking pets as therapy (PAT) training to become part of wellbeing provision at the school.